Earlier in the season I imagine Shanahan would have taken more interest in both the Rinaldo hit on Galiardi and Vlasic’s boarding on Briere. I wonder if the Injury Tsar will be as merciful? The fact that Briere admitted to being dizzy after the hit made me wonder how anyone could assume he is fine just because he went back on the ice. Has no one been paying attention? My worry-meter is also twitching over Galiardi’s health. I don’t know what anyone else was looking at, but I saw a guy spun around by a hit to the head. I do not believe he is fine. I was glad the Sharks took him off the ice to check but I still don’t believe. I didn’t get a good look at the much-booed kneeing at center ice during the game. Now that I know it was Hartnell, um, well, skating isn’t his strong suit. Nonetheless, it could have easily been called, you know, if there were any refs present. Besides, he’s already gotten away with that once this season. The broadcasters and journalists didn’t pay it much mind, any more than the tug of war between Kubina and Clowe, or high sticks or a couple of trips in there. I know, a lot gets missed in a regular game but that was truly ridiculous. I have never seen two players stand there for so long tugging on a stick, two hands and all. That went on for way too many beats. They were kind enough to tweet that hockey fans in Nor Cal should follow Kevin Kurz. Gee, thanks. What would we do without you? By one-sided I mean he said nothing of the Rinaldo hit. I’m easy, bash both non-calls and I would consider you unbiased. This is fast turning me into a different kind of homer, biased on the side of bloggers which I never was before. The Sharks writers didn’t tweet about the hits last night but they did mention them in their blogs: Working the Corners, Sharks Talk. That’s better. Isn’t that a sweet thing to say? I have no idea if it’s relevant, since that high scoring trait goes with a whole lot of goals against… but it sure seems like a nice thing to say about the Flyers. I don’t know what Rinaldo had to say. No one asked him. Galiardi said he was fine. Uh-huh. The Sharks guys didn’t tweet about any of those hits during the game but they did mention both of them in their game reports. Fear The Fin tweeted about both hits, but they can do that since they’re technically bloggers. They can do things differently from those other guys… or something. I don’t think letting the players fight Simmonds would have changed any of that. How about trying the “call a penalty” strategy first? I did think it very strange that the refs let pretty much everything go except fighting. Unfathomable logic. Maybe everything else just moved too fast for them to catch. Once the teams knew they were on their own, I think they mostly behaved pretty well. I don’t know if they’ve been in many games where there’s no fighting and no penalty calls. Yay teams! Nothing out of the ordinary in that Rinaldo hit. I did say he is a sharp object. I liked the hits that came seconds later from Demers and Burns, though I really prefer simple eye for an eye and Briere shouldn’t be held responsible for what Rinaldo does. That’s on Lavy, but hitting Rinaldo works too. I thought Clowe was skating more nimbly than I’ve seen in a while. I wonder if he’s doing something new? I don’t think Vlasic was trying to hit Briere hard but it was a dumb hit. He shouldn’t have pushed with his hands up so high. The only way he could have avoided it would have been to throw himself to the side to avoid contact entirely but I don’t blame him for not doing that. Still, it was a very dangerous collision. Really missed Couture out there. Not that the team had trouble without him but I felt like there was a gaping hole where 39 and 64 used to be. Get well soon, Couture. Shortly after the Sharks killed off the bizarro roughing penalty to Winchester, I noticed that they were still stuck in their zone. I asked a friend if the Sharks were on a penalty kill because that’s what it looked like. I asked just in time for White to shoot the puck over the glass. Ooops. Later, while discussing the Rinaldo hit, I commented that at least the Sharks didn’t have a suspension coming, which observation was quickly followed by the mess I could not see in the corner that involved Vlasic and Briere. I shut the hell up after that. I think Bryz hurt his back. Just what the Flyers need- another goalie with a back problem. This is disappointing but I’m not freaking about it since it isn’t a head injury. Be well, Bryz. 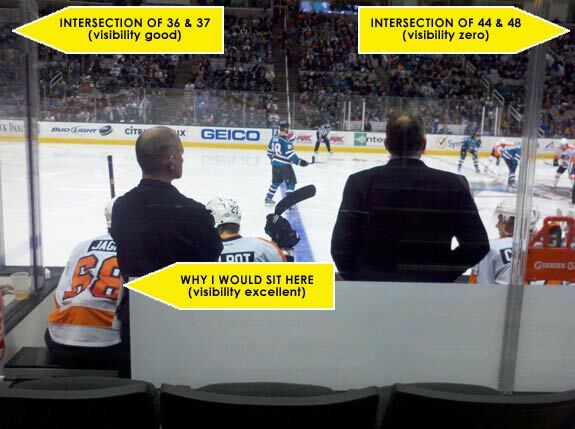 Finally, I would love to know what the Sharks and their co-coaches did to pull this off: @sharkvoice: “Not only did Sharks shut down Flyers high powered offense but also held Claude Giroux without a shot for first time in 66 games.” Giroux isn’t known for being a slacker, so I’m going to go back and watch again to see if I can figure that out. Because that is pretty awesome, to do that without even hurting him. I definitely share your feelings and emotions when it comes to watching both of “your teams” play each other live. My family is from Detroit so I’ve been raised a Red Wings fan, however I’ve lived in Phoenix my whole life. I wouldn’t technically consider myself a Coyotes fan, but I do like to see them do well, so when the Red Wings come to town it doesn’t matter to me who wins. I may go to the game in one of my Wings jerseys, but when it comes down to it I just want to see a good game, and it usually is. It’s always a blast going to the games involving both of “my teams” because I will most likely leave satisfied at the outcome no matter what it is.